ALIOS EVO is a proven alternative to the production of fresh water with evaporation, since there is no need for the operation of the main engine or the boiler of the vessels , thus minimizing energy consumption. 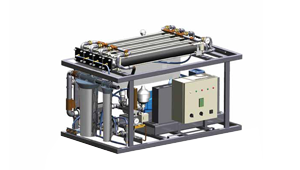 The system is able to produce reliable fresh water from the desalination of sea or brackish water and can be configured (skid or loose mounted) with variable features in order to meet any customer requirements. ALIOS EVO is equipped with the CIP system as standard to facilitate maintenance. The produced water is constantly monitored with a TDS meter.